The smell of aloe vera hung hazily in the air as the warm April day descended into the evening. The Queens Theatre at Flushing Meadow Park was filling up with teammates and family members, girlfriends and coworkers, all ready to watch another successful Warriors Cup. 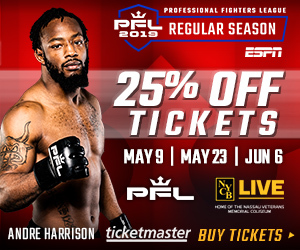 Chris Tran, the mastermind behind the card, was rushing about backstage as he ensured every fighter was handled properly and that everyone knew where to go. Separated in their red and blue rooms, fighters began to pray or perform rituals as their cornermen rubbed them down with liniment. It had been a warm day and to get to the theater, one had to walk through families picnics and children’s buzz of excitement that summer was finally coming. The lights in the audience were dimmed and the focus on the stage got even brighter. It was show time. Octo started aggressively in R1 by focusing on punches to the body. Ortiz cut him off to clinch him in a corner. Ortiz took control back in R2 by getting Octo in clinch once more as well as working the body aggressively and getting a cross to the face when Octo kicked. By the end of R2 Ortiz had dominant ring craft and was pushing Octo around the ring with his strikes. R3 was a battle of who wanted it more, as Octo came in with the first strikes but Ortiz worked to keep him in a corner once more. Both men exchanged a flurry of head kicks and teeps as they fought to have the final strike. 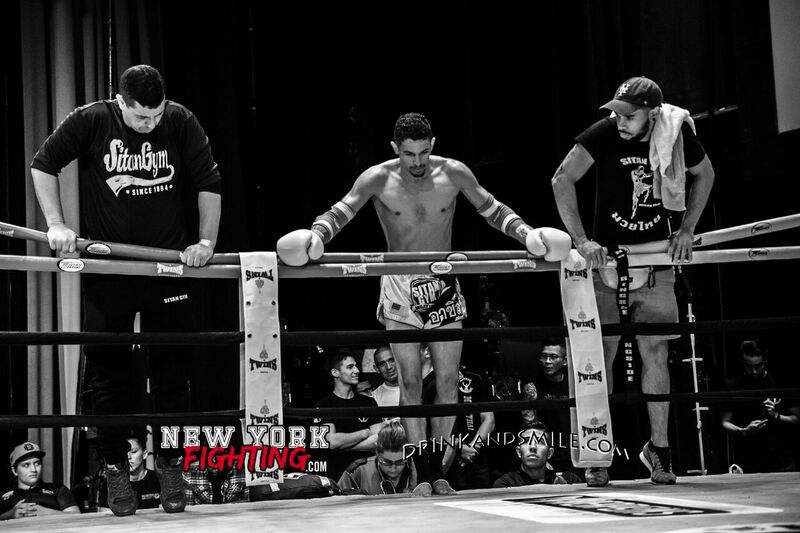 Ultimately Ortiz’s defense and aggressive ringcraft helped him to win the bout. As soon as the bell rung, Boyd went straight into clinch and caused Shen to topple over. He pushed him into a cornerpost powerfully with a head kick and a succession of teeps. 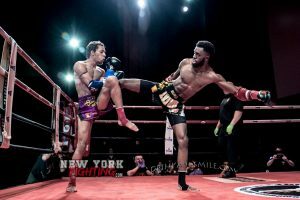 Boyd used his knees to corner Shen as well as utilized his punches to not allow his opponent to retaliate. The fight was called for Boyd seconds before the end of the first round ended due to his impressive and dominant technique. Santiago began with a teep that pushed Solano back, but the two men immediately began working in clinch. Santiago used his boxing to his advantage as the two men entered clinch once more to fight for dominance. Santiago also switched between southpaw and orthodox to land jabs straight down Solano’s open guard. In R2 Solano went after Santiago’s legs as he checked but still had a difficult time with Santiago’s boxing. Santiago’s dominance was apparent in R3 as he worked aggressively with strikes such as kicks and jabs to the head immediately. He was able to sweep Solano as clinch became the name of the game for the 3rd round in a row. Santiago finished the bout with a flying kick, cementing his win. R1 began with boxing between the two women as they engaged immediately into clinch. Maclane struck Budhu’s unprotected face as Budhu attached Maclane’s thighs with painful low kicks. Budhu got in a few clean overhand crosses before Maclane came in aggressively with strikes to the face. R2 was very similar to R1 as Maclane consistently jabbed the shorter Budhu, but Budhu retaliated with several powerful crosses and hooks that knocked her opponents head back. 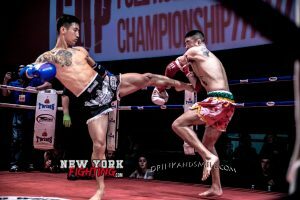 As R3 began, Budhu continued attacking Maclane’s front leg with a barrage of low kicks. Maclane answered back with jabs to the face and a quick game of clinch. 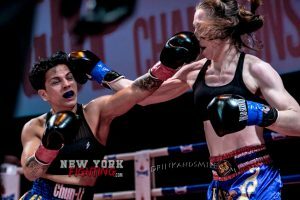 Despite Maclane remaining in the center of the ring, it appeared that Budhu had the dominant ringcraft and continued her consistent combinations of a one-two jab-cross and low kick which assisted in her win. Mickey worked R1 in southpaw, catching Rhode’s kick to sweep him and answering with an immediate headkick. They became entangled in a frighteningly aggressive clinch as the two worked their elbows. R2 had Mickey work to close the distance several times as he used his punches and elbows within clinch, as well as kept Rhodes on the ropes. Rhodes teeped to keep Mickey at bay. Mickey cornered Rhodes into a post as the two worked once more on using their elbows to attack. In R3 Mickey maintained his aggression with body kicks and knees. Pilla used her teeps to keep Brady back before they entered into clinch. She used a jab-cross body kick combination multiple times before Brady got her leg and swept her. Pilla used another teep to push Brady to the ground before the bell sounded for the end of R1. R2 saw Pilla utilize her combination as Brady used her clinch to gain some points. The two women used the ropes for support as they worked their clinch before Pilla went for her strikes. Pilla entered R3 very dominantly as she used her elbows and body kicks to keep her opponent back. The two engaged in clinch multiple times before Pilla finished the fight with her strikes and teeps. 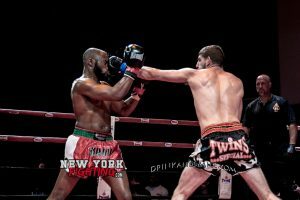 The bout began incredibly heated as the two jumped into clinch and kneed each other painfully and quickly as they worked the body. Lopez appeared to have the dominance in clinch with his aggressive and powerful knees, even as De La Cruz was able to focus more on his punching. R2 began just as aggressively as the two found themselves in clinch once more and Lopez turned his knees into daggers to hurt De La Cruz. Lopez kept De La Cruz on the ropes and didn’t allow him to box his way out of the clinch. The two embraced at the beginning of R3 before Lopez initiated the clinch once more. A shot to Lopez’s groin had the action stopped momentarily before they resumed their battle. Lopez finished the fight the same way he began, keeping De La Cruz in a corner and in clinch. After a few body kicks, Gorman entered clinch with Henderson and managed to push him into a corner. Henderson broke out of clinch and reinitiated after emphasizing his boxing. At the beginning of R2 Henderson was able to sweep Gorman before the two entered in clinch once again. Henderson worked on kneeing Gorman incessantly while Gorman utilized his kicks for much of the round. R3 went differently than the previous 2 as Henderson came in several times with an overhand jab and Gorman attempted several head kicks. Henderson landed several punches to Gorman’s head as well as a few to his midsection. As Henderson worked to close the distance, Gorman tried to use his length to keep him away. After 3 rounds full of knees, Henderson took the win. William controlled the ringcraft for the first round as he he kept Kataw moving from his body kicks and jabs. Kataw attempted a spinning back fist but William was able to create distance and utilize his body kicks. They entered clinch briefly before boxing. The bell rung as Kataw came with another spinning back fist just as William moved out of the way of it. In R2 Kataw attempted to pressure William but that quickly reversed as William was able to push him back to the ropes multiple times. Kataw came with a spinning back kick but mostly worked low kick and punches to the head. William was able to catch some of Kataw’s kicks to move him back with his own kicks. R3 was high-paced as the two three punches rapidly. While William continued to catch Kataw’s kicks, Kataw was able to get in crosses to William’s face. William finished the fight with the final punch, almost knocking down Kataw’s protecting hand. Cho started the fight in southpaw as Corona landed a lowkick. Cho was able to catch his next attempt and sweep him. Corona came after him with a straight down the face, knocking Cho to the ground. Corona set up several kicks by throwing his jab and cross, but Cho used his footwork to circle out of a consistent distance. Despite the fact that Cho was active on the canvas, Corona aggressively attacked him in a corner, utilizing his jabs, crosses, and elbows. After several seconds of this, the bout was called for Corona’s impressive and quick TKO finish. Bobinchuck was very active as he circled around Fords and alternated between attacking his lower legs and kicking his head. As a contrast, Fords held very still and used his teeps or his hands as a power strike. Bobinchuck was able to sweep Fords right as the round closed. R2 had Bobinchuck throw several varieties of kicks from body shots to a spinning back kick. He cornered Fords and looked as tho he attempted Saenchai’s cartwheel head kick, but it didn’t land. Once Fords got him into a corner, he was heavy-handed and made the situation increasingly dangerous for Bobinchuck. Bobinchuck was able to get out and circled around him with strikes once more. Fords went into R3 fighting southpaw but Bobinchuck continued to alternate kicks from the lower legs to the head. Near the end of R3, Fords got Bobinchuck with an elbow that sent him sinking, nearly knocking him out. The men finished the last ten seconds of R3 punching each other as Bobinchuck created distance to recover from the striking blow. R4 had Fords attempting to close the distance once more to attack with another powerful elbow. Bobinchuck instead entered the clinch and used his knees as an attack. He then focused on kicking the body as Fords went for his legs with low kicks. R5 had the action stopped as Fords recovered from a hit to the groin but Bobinchuck renewed the action with a jumping flying roundhouse kick to the head . He continued to press on with several kicks before the two entered clinch. The last minute illustrated Bobinchuck’s perseverance as he alternated between kicking Ford’s low legs and getting hooks to his face. Hussain started the fight by punching Troy’s face and hitting with low kicks. He controlled the ringcraft as was able to lure Troy into the clinch, where he managed to land elbows. Hussain maintained dominance during the first round as he continued to land knees as Troy fought for position and to exit. In R2 the two answered each other with back to back body kicks. It appears that Hussain’s foot became injured as he fell backward, but he continued to pressure forward. Troy landed a few headkicks but Hussain finished the round with them in clinch. R3 showed a more aggressive Troy as he managed to dump Hussain twice and then land a head kick on him immediately after. 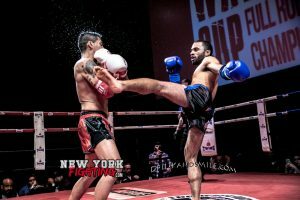 Hussain went to attack Troy’s legs but then finished with an uppercut-cross combination, to kick his leg out and sweep his feet from out under him. In R4 Hussain worked a few jab fakes before coming in with a teep. Troy was fighting southpaw as the kicks became more vicious. Hussain continued to pressure with his punches before ultimately coming in with a cross so powerful that it knocked Troy into the ropes, where he had a 5-count before he was able to stand. In R5 the pressure shifted between the two as they went straight back and forward with their attacks. While Hussain favored farther away kicks, Troy continued to close the distance before Hussain’s strikes became too aggressive. Hussain punched Troy with a cross and knocked him down again for another count, before resuming, to be knocked down once more and have the fight be called TKO in favor of Hussain. Chun put Lin on the defense with the first body kick but Lin closed the space and looked to get Chun in the clinch. Chun broke out and pressured Lin backwards before Lin got him in clinch against the ropes. Chun managed to reverse as the two looked for openings to knee. In R2, Chun pressured Lin once more before with his boxing as Chun worked to close distance and utilize the clinch. The two attempted to dump one another in R3 but Chun worked the body with punches. They moved actively on the canvas as Lin got in a hook to the body followed by a body kick. They entered the clinch once again and both threw their own elbows as the bell signaled the end of the fight. Guzman and Hill began the bout testing each other’s reactions by kicking low strikes to each other’s inner and outer thighs. Guzman maintained the center but Hill was able to circle in and out while utilizing a jab and low kick. They briefly entered clinch before elongating their distance to kicking range once more. In R2 as Guzman looked to close distance, Hill would answer with a low kick and jab to Guzman’s dropped guard. 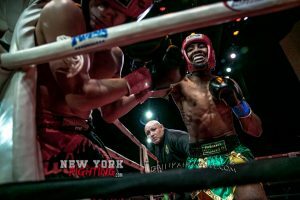 Guzman looked to pressure as by attacking with low kicks then using his jab. Even as Hill was cornered, he was able to circle out and defend against Guzman’s power shots. Hill got in a clean jab on Guzman’s face as the round ended. R3 illustrated Guzman’s opening, that every time he came in with a low kick, he would drop his hands and allow Hill to use his jab-cross. Guzman pressured Hill into corners several times with his punches, landing several clean crosses to the head. While both appeared slightly apprehensive during the end, they finished strong with back to back low kicks. The beginning of R1 was technical as they looked to score with their teeps and body kicks. Kuldraree looked for an opening with his elbows and took the opportunity to get Geffen in clinch. Geffen kept Kuldraree at bay with his body kicks and teeps. The men entered clinch quickly in R2 as Kuldraree continued to catch Geffen’s kicks and back him into the cornerposts. Despite catching another of Geffen’s kicks, Geffen answered with a cross and was able to twist out. Kuldraree kneed Geffen powerfully as Geffen worked to open distance once more. In R3 they both jumped into clinch once more as Kuldraree worked to throw his elbows and punches to the face. Despite Kuldraree’s pressure, Geffen responded with punches and teeps to keep him away. Kuldraree managed to get him in clinch once more and gained points with his knees. The round ended with the two of the men embracing as friends.